After the heartbreaking loss in the BCS Championship game following the perfect 12-0 2010 regular season, The Ducks entered the offseason with some optimism, and some uncertainty. The hurt of falling just short (some would say, a wrist short) of a national championship was a sting that remained resilient for a long time waiting for the 2011 season, the return of football the only thing that could salve the wound. Even with many returning starters, it was clear that the 2011 Ducks would be a different team than the perfection of 2010. How would they fare after losing key players like Jeff Maehl, Brandon Bair, Casey Matthews, and Spencer Paysinger? Would the team be able to reload with players already on the roster, or perhaps land a freshman that could step up and make an impact? After months to digest and rehash the few plays and calls that cost the Ducks a national championship, during the aftermath, fans were left wondering–what just happened? Wasn’t Dyer down? (Answer: Yes — the wrist counts) Will the Ducks ever make it back there again? Also, could we all just be a little bit happy to make it to the big game, even if it meant losing? And how might future recruits view the program after losing consecutive BCS games? While fans eventually turned their attention towards the offseason and recruiting, the nation was ablaze in commentary that the Ducks simply couldn’t win it all. The Ducks were branded a finesse team, their fancy scheme could win a lot of games sure, but it couldn’t hold up to an elite defensive line. Get a few NFL body-types on the defensive line, and Oregon wouldn’t be able to counter. What was perhaps lost in the discussions was that no team in the entire country fares particularly well against those types of teams with those specific types of athletes, that’s why they are so highly coveted and rare to get. Just look at the game scores of a typical SEC game. (9-6 in OT, anyone?) Nobody scores very much, unless it’s against Georgia State or Middle Tennessee. True, Oregon did have a difficult time blocking Nick Fairley, but who didn’t? Luckily for Oregon, being on the big stage so often would prove to be a boost in many ways. One of the biggest benefits of being in the big game came late in the recruiting season. The day before recruits sent in their letters of intent, De’Anthony Thomas switched his commitment from USC and instead chose to join the Oregon Ducks. I was driving home at the time listening to local sports radio when they started talking about a 5-star recruit that had committed to USC as a defensive back, but had changed course and was now planning to sign with the Ducks as a running back. He was billed at the time as sort of a potential “LaMichael James-Lite” at 5’9″, 173 lbs. He was said to be the national #1 overall recruit, possessing blazing speed. He was supposedly a southern California high school legend that had smashed all sorts of records, scored ridiculous amounts of touchdowns, and even carried the moniker “The Black Mamba” as coined by youth coach and hip hop superstar Snoop Dogg. At that time, the Oregon depth chart had LaMichael James, Kenjon Barner, the much ballyhooed Lache Seastrunk, and young bruisers in Donte Williams and Tra Carson at runningback. It seemed unlikely that a true freshman, no matter how good he was, would fight his way through that much talent, but that maybe we would see him after a redshirt year. At his size, it seemed logical to give him time to transition from high school, learn the offense and bulk up. Besides, Oregon already had three small-ish fast guys in James, Barner, and Seastrunk. The season opener against LSU in the Cowboy Classic was still looming 200 or so days away, and while the coup seemed like a good one for Oregon, few could have imagined immediate and electric impact he would provide for the Ducks in just a few months time. Intertwined in the massive hype prior to the LSU game were the usual questions about player personnel, and the promise of the unknown that a new season provides. Perhaps nobody impacted that first game quite the way De’Anthony did, and not only on the fumbles. It was the way he moved on the field and the ease in which he did it that jumped off the field, even if a little careless with the ball in his first collegiate game experience before a nationwide TV audience. His speed advantage was glaring, the highlights showed him making big gains, or that there were big holes opening up when the turnovers happened. Had he held on to the ball a little better that day…Well, we won’t get into all of the what-ifs left in Dallas that day. As the season progressed, so did De’Anthony’s production in games. Seemingly eager to make amends for the opening loss, DAT regained his composure, and took it out on the remaining opponents on the schedule in ways few have if ever at the University of Oregon. In 2011, who would have guessed that a true freshman would step in and actually amass more all purpose yards than the returning Heisman candidate finalist LaMichael James had (2,175 all purpose yards) in his record-breaking season last year? Hard to envision, but De’Anthony (2,235 all purpose yards) was able to fill exactly that order. From the edge-of-your-seat 4th down turned touchdown against Stanford, to the momentum-changing kick return against USC, the extremely efficient embalming of the Badgers D in the Rose Bowl, to the poor and unfortunate WSU defensive back who is still trying to find which direction De’Anthony was going; “The Black Mamba” provided a long list of highlights that will not soon be forgotten. What better way to cap the best freshman year in memory with his two very memorable carries in the Rose Bowl, both long touchdowns. Because of his exploits last season that were made even more remarkable coming from a true freshman, De’Anthony has placed his name near the very top of the list of Pac-12 Heisman contenders in 2012. It could be said that rarely do these early projections pan out, the only sophomore Heisman winner in NCAA history being Tim Tebow (2007). For example in 2010, you would not have been able to find Cam Newton’s name on many lists, yet by the end of the year he was worthy of the first overall NFL draft pick. Andrew Luck was a lock to win the Heisman two years in a row, until he played against Oregon each year. But, as things sit right now entering the summer, it’s hard to imagine a player that will garner the amount of interest from all across the country as much as De’Anthony Thomas will. It was just recently announced that Oregon’s first game will be carried nationally by ESPN, a game against a huge underdog in Arkansas State. Why would ESPN carry such a predictably one-sided affair? 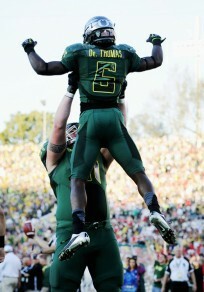 To showcase De’Anthony Thomas and the new-look Ducks, now without LaMichael James or Darron Thomas. He may very well be the most intriguing player in all of college football right now. In Real Estate, appraisers are commonly striving to establish what the “Highest and Best use” for a property is, based on the various merits of each individual feature. As with appraisals, there are many variables to assembling an overall value of an attribute; however there also conveniently exists an extreme amount of precedence for the value measurement as many properties share similar characteristics. And if you’re wondering where in the heck I am going with this, it is that one of the most intriguing aspects of De’Anthony’s game to me is that there is virtually no precedent for what he has done. Sure, there have been hoards of players who can run, catch, and return kicks with great skill. The difference is, none of those other players officially lined up as a “tazer,” a hybrid runningback/wide receiver position intended to get Thomas into open space with the ball as much as possible. Sort of like when someone constructs an incredibly unique dwelling, sometimes there are just no built-in guidelines for value. Everyone knows the value of a 1,000 yard running back or receiver, but what about a 2,000+ yard Tazer? When comparing De’Anthony against other players, what other tazer-types can be used for comparison purposes? Kenjon Barner in 2010? Is there anybody else? So, what is the highest and best use for De’Anthony? Is it at running back, or split out wide at receiver? Is it returning kicks, as a gunner on punt coverage, or what about the lockdown corner prospect that USC and other teams had him pegged as, calling him a guarantee for the NFL at the position. The answer is probably yes to all, which is why Thomas is able to provide such unique value to the Oregon football team that really no other player in the country can match. He makes an impact at times by just being on the field, even when he is not the primary target for the play, his role as a decoy and the threat of getting the ball is enough to keep a defensive coordinator up late at night. Chip Kelly and Mark Helfrich were given the enviable task of determining placing DAT where he was most valuable, and they chose to virtually create a position for him, in hopes of maximizing all of his potential value. If you were in the coaches shoes, where would you play him most often, and why? Here are some of DAT’s greatest hits, compiled just for you from Duck highlight video guru Mike Wines. And, if you need a reminder of just how competitive most of the LSU game was and you have about 9 minutes, watch this!